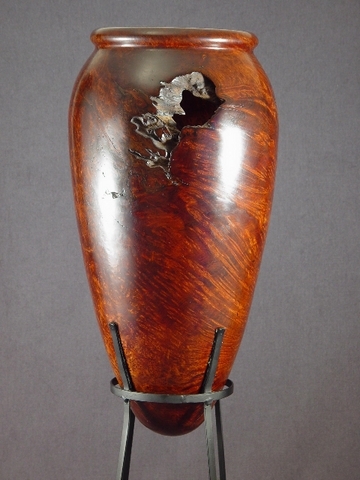 I use the term to refer to those objects in our collection that are vaguely vase-shaped, but do not have a foot or base that will keep them upright. Thus they require some sort of stand to hold them up. I am attaching a photograph of the first such object that I acquired -- an old growth redwood piece by Julian Shaw. He referred to it as an "amphora", and so I've been using the term. This was in his "Ancient Vessels" series, in which he recapitulated "classic" forms. I shall bring all of my various "amphorae" to the meeting to inspire you (I hope). Bill Johnston, who has been in charge of the basic skills class, has informed the board that he can no longer participate in the club activities as he must devote more time to family matters. He has relinquished the post of Vice President, but will remain a member, albeit less active. We thank Bill for all his superb efforts in spearheading the classes, but also for his many contributions to the club especially in the finishing area. Under our normal, two-year succession plan, Bill Johnston would have assumed the role of President for the next two years (2011, 2012) in January 2011. We would have had an election in December 2010 for the next slate of officers. The board would like to accelerate this process a bit, and to engender a greater level of participation in the club activities. Frankly, the old timers are ... well ... old, and we think that some of the newer or less active members should step up to ensure some continuity. To that end, we will establish a nominating committee who will reach out to you all to request your participation in some area. I will prepare job descriptions for all the roles, and we will work with the current occupants of those roles to find and train appropriate successors. An excellent place to start your increased volunteerism will be the upcoming competition and show. Ken Clifford has successfully engaged the Los Altos Youth Center for Sunday, July 18th, 2010. Thank you Ken! We are committed to making this happen, and we all need to pitch in. Under separate cover I will be sending a project breakdown to you all, and I expect to assign names to each of the areas that I have identified at the next meeting, so please look over the list and determine how you can help. Feel free to point out to me things that I might have forgotten. Minutes of the Monthly Meeting of the Westbay Woodturners, April 13th 2010, held at the Los Altos Youth Center. Meeting Notes: President Edgar Whipple called meeting to order at 7:10 PM, with a let’s get started, urgency in his voice. New Members/Guests: Brian White identified himself as a new turner. He doesn’t know all the great tools he needs and wants to buy that are waiting to jump on his credit card. Also attending for the first time was Julie Collins, a pen turner that had several of her creations to show. From the looks of her pens, she could give advice to some of our seasoned “vets”. She found out about WBAW through a chance meeting with Cecil Dobbs at the lumberyard? We hope Cecil’s wife knows about these chance lumberyard encounters. Vice President Bill Johnson announced the 3rd and final 2010 Basic Skills class is scheduled for Saturday, May 8th from 9:00 AM to 12 noon, at Jim Laflin’s shop. This session will focus on sanding, finishing and buffing. See the web site for details. The previous session had Barry Uden demonstrating how to turn a bowl. It was a fantastic presentation by Barry with excellent membership participation. Bill was selling CA glue and accelerator for the final time at the meeting. The club thanks Bill for doing this service for the club. Those members, who did not take advantage of the great club prices for CA glue, will have to buy retail. Treasure Ken Clifford flatly stated that if you didn’t pay your 2010 dues, you ain’t no member. To rejoin the club, see Ken and ask for mercy. New membership dues is at the rock bottom price of $25.00. Heck the coffee and cookies at each meeting are worth that much alone. Ken commented that the club has about $4000.00 in the bank and this will help cover the costs for our upcoming artists presenters. Program Chair Pat Crowley has identify the May club program is reverse turning using various chucking techniques. Richard Winslow was on hand to deliver tools and supplies that were ordered for club members. He also noted that the next tool order is ready to be submitted, so if anyone has a last minute order, see him ASAP. As a reminder from Terry Gannon Club Webmaster, the club website, has a slightly different spelling. Please use http://www.westbaywoodturners.com/. The Librarians, Patty Dowden & Tony, have noting new to report, just lots of good DVD’s and books ready to check out for a buck. The ever-present Jim Laflin has Anchor Seal for sale at the club discount price of $13 per gallon. Get in line before that 55-gallon drum runs out. In March, Steven Hatcher presented his stone inlay techniques and as David Vannier stated, this was one of the best presentations that the club has sponsored to date. The attendees were shown Steven’s process for inlay, which will be seen as part of the show and tell tonight. The club thanks David Vannier for allowing the use of his garage to host the Steven Hatcher demo/hands on. David also announced that Malcolm Tibbetts demonstration has been scheduled for August, 2010 and Mike Mahoney might be available on October 2. These are both excellent woodturners and not to be missed. More information on dates and time, will follow. Several members announced that the AAW symposium is coming up June 18th through 20th in Hartford, CT. By a show of hands a few members will be attending this event. Also on May 6 through 8th the Utah Woodturning Symposium will be held. And finally, David Vannier engaged the membership in a discussion that next year will be the 25th AAW anniversary in St. Paul Minnesota and that the club should consider organizing the building of a club project for contest entry. Dave is asking someone from the membership to step forward to lead in the organization effort. Another announcement concerns the club juried show and demonstration. Because we will not be participating in the Santa Clara Wood Cravers show, WBAW has reserved the Los Altos Youth Center meeting place for Sunday 7/18 for a juried show and demonstration. The regular monthly meeting will be rescheduled to be on Tuesday July 20th, at which time the judges will provide comments and critique. Ron and Cecil have gathered wood and they will make it available to the membership. We should keep in mind that we will need wood donations to auction off at the August barbeque, so members are encourage to save wood for that purpose. Richard Davis was the first to show his pepper mill turned out of laminated scrap Claro Walnut, Spalted Maple burl and Asian Ironwood. A very colorful and interesting piece. Jim Laflin was next with his pepper mill turned from a glued blank of Paduak next to Maple. He noted that when you use Paduak next to a white wood, it turns the white wood pink. So if you are not into pink wood proceed with caution. Fred Rastgar, last month’s demonstration and instigator of this pepper mill mania, returned to show his very hansom turned blank that was cut on an angle. The blank was composed of Bocote, Wenge, Bubinga and Bloodwood, a truly beautiful pepper mill. Harvey Klein showed his pepper mill made from a blank of 300 year old Oak and Cocobolo with a very nice design and execution. Tom Haines who made three pepper mills. The first was out of Curley Maple, the second of glued up pieces of wood (he never throws away good small cutoff) and finally the third of Purpleheart and green wood? In order to turn his pepper mills he turned a jam chuck to support the bank after is it hollow. Curtis Vose turned two shorter pepper mills out Purpleheart. One for pepper the other for rock salt. Bud Trapp displayed what he called a Butterfly bowl made from the limb of a Crabapple tree. The wood spalted and when it was turned it takes on the appearance of a wing. Gene Frantz presented the stone inlayed plate he made in the Steven Hatcher hands on workshop. Ty Head’s show and tell piece was a beautiful turned fluted, that was made from some sort of wood. Ask Ty what he used. Jim Laflin had his class example of a stone inlayed plate from the Hatcher demo. He said it was one of the most fun demonstration classes he has ever taken. Glen Krueg, showed the turning tools he made out of 20/60-tool steel, which were very interesting. Cecil Dobbs came with two turned and inlayed plates from the Hatcher hands on class which were a beautiful as the others we have see so far. He thanked Dave Vannier for turning the two maple blanks that he forgot to bring to the class, but he did finish the bottoms at home. Ron Gerard made two tools; one a 3/16” chisel at the College of the Redwoods with handles made of Modesto Ash and Ebony end pieces and the other was a tool for unknown purpose (ask him). Tony Dowden brought a tool scraper he made out of 3/16” steel with a very nice turned special handle. Dave Vannier talked and showed the bowl he made at the Steven Hatcher hands on class. He also expressed his pleasure with the experience and the techniques that Steven showed the class. George Lutz also brought his plate made at the Hatcher class and like the others, was a beautifully executed piece of turning and inlay. His only issue was the rim was very thin and in order to pack in the stone inlay you need a certain amount of depth. Next time he will keep the rim thicker. From all the discussion and comments the Steven Hatcher was a smashing success. Claude presented a power point presentation on Tool Making for Woodturners. The presentation will be posted to the WBAW Yahoo Groups site for club members reference access: http://groups.yahoo.com/groups/wbaw/. 1. Metal Technology – Steel for making tools: a). Up unit 1970 all turning tools were made from Carbon tool steel. b). In 1980’s High Speed Steel (HSS) aka M2 was introduced c). Then followed by High Performance tool alloys and powder metallurgy (PM). These alloys include Molybdenum M4, Cobalt Tungsten ASP or 2060, Vanadium CPM aka A11or CPM15V d). Next came Tungsten Carbide for bits and inserts and e). the future could be Zirconia Ceramic alloys. As a side note here, the best High Speed Steel is made in the UK or USA. Other foreign manufactures do not have the QC controls in place yet to be consistent. 2. Metal Technology – Alloy Characteristics: When choosing a steel the following factors need to be considered and weighed against each other, because no alloy possess all these at the same time. Hardness, Wear resistance, Toughness and Machineability. 3. Industrial Fabrication: Manufactured tools are usually made using computer controlled machines, centralized hardening and tempering. Often made using vacuum heat chamber for low oxidation and some are cryogenically cooled for better grain structure. 4. Making Tools at home: Carbon steel, A2 or 01 should be used because they are easy to work and grind and can be heated in the house on the kitchen stove. HSS steel can be difficult to temper at home as it needs about 1000o F., however it can be shaped on a grinder and machined to shape while tempered. Claude uses a angle grinder with a diamond blade and a water drip. He also uses Diamond tipped burrs in a Dremel tool. 5. Sources of carbon steel: old files, drills, automotive leaf springs or band saw blades. For A2 or 01 steel, you should purchase drill rod, jointer knives, industrial saw blades or cheep turning tools. Annealing – Heat the steel until it is non magnetic (this is called the Curie point) and allow to slowly cool over 1 to 2 days. This will allow it to be machined. Hardening – Heat the steel until non magnetic and quench rapidly. Tempering is done to get the desired tool hardness. Reheat the steel to a temperature, which is a “straw color” and then quench rapidly in water or oil. To machine HSS steel into a rough shape, use a grinder or diamond wheel. Tempering will require the use of a high temperature torch. As and example ,Claude had a number of tools he made that were shown to the membership. These include lathe tools with handles and boring bars that incorporated ¼” tool bit inserts. The handles were made from hose cover material purchase at Industrial Supply in San Carlos, but see his presentation for details. These were very factory manufactured looking handles. His tool bits can be removed from the handles by loosing setscrews. He purchases the tool bits from several sources, including ENCO tools. They also have tool steel and drill rod. Shipping is very fast, usually the next day. President’s challenge for May: Edgar said make whatever turns up.